The makers of popular testosterone therapy drugs, also known as “low T supplements,” are facing lawsuits across the country as the link between the medications and heart attacks becomes known. As more studies back the causal connection between between testosterone therapy and cardiac problems, the FDA has undertaken its own investigation into their effect on the risk of stroke, heart attack, and death. Consumer advocacy groups are requesting that the FDA require a “black box warning” on all testosterone supplements to put the public on notice that they pose a serious risk of injury or death. In November 2013, the Journal of the American Medical Association published a study that examined 8,000 male veterans with low testosterone. Even after accounting for age, blood pressure, pre-existing heart disease, and other negative factors, the researchers found that men receiving testosterone supplements were 29 percent more likely to die, have a heart attack, or have a stroke within three years of use. A second study showed the effects of age and underlying heart conditions. It found that men over 65 were twice as likely to have a heart attack in the first 90 days of use. Men under 65 who had an underlying cardiovascular condition were 2-3 times more likely to have a heart attack. Marketing of low T supplements has been incredibly successful — so successful that the site Drugs.com reported that in 2013, there were more sales of Androgel than of Viagra. Androgel is one of a number of testosterone gels on the market. They are distributed as topical ointments, sometimes rolled on like deodorant. Androderm – manufactured by Actavis, Inc., formerly known as Watson Pharmaceuticals, Inc. In each of these groups, the patients’ heart attack risk doubled in the first 90 days of testosterone therapy use. Researchers believe that the testosterone causes clotting, which can be a problem for men with thinner vessels. The pharmaceutical companies spent over $3 billion directly marketing drugs to consumers last year and it has paid off – in 2012, there were over $2 billion in testosterone gel sales in the United States and experts expect that number to double by 2017. Many doctors think that there is little to no benefit of the drug to most of the patients requesting it, but they do question their safety. 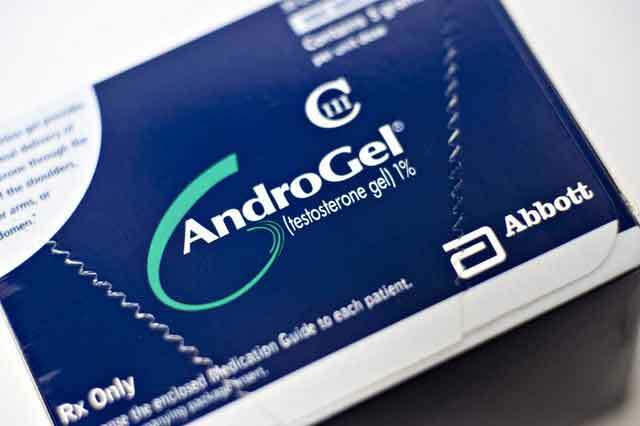 AndroGel is the most popular low T supplement on the market and has already been identified in a number of lawsuits. In 2012, Abbott Laboratories, which owned AndroGel until early 2013, spent $80 million advertising the product. Men injured by the testosterone therapy claim that this advertising is deceptive. In early 2014, just days after the FDA announced its investigation into the safety and side effects of low T supplements, five Chicago men filed federal complaints in Illinois against the AndroGel manufacturer. The complaints allege that Abbott Laboratories deceived the public by relaying only positive information about the drug while downplaying the known serious health risks. More than 30 victims have now filed lawsuits against the AndroGel maker in Illinois. Cases have also been filed in Colorado and Pennsylvania. The Judicial Panel on MultiDistrict Litigation is considering consolidating all of the cases against the manufacturer. Testosterone therapy lawsuits are still in the beginning stages but as the FDA investigation continues, more evidence of the dangerous nature of the drugs is expected. Unfortunately, the time to file a personal injury lawsuit is limited by the statute of limitations. Product liability attorneys can evaluate a patient’s claims to help decide whether a lawsuit is in his best interest. Compensation may include recovery for medical bills, lost wages, pain and suffering, in addition to reduced earning capacity.